Redolent with the scent of clove, cinnamon, nutmeg and pepper that arrived from far-off markets by freighter at St. George Harbour. A heady, aromatic blend following a closely-guarded recipe that contains the world's finest essential oils. Prized for its warmth and most mysteriously manly appeal. For use as an after shave or body cologne. There are 9 reviews of Royall Spyce. Bought a bottle of this in the Early 80's. A wonderful spicy concoction that had a beautiful nutmeg and clove plush drydown that was perfectly "Old Style" in this time of the bold monster Masculines. I bought it along with a YSL Tuxedo and Charvet Silk blouse which were "de Rigueur" before Armani. A sniff of the latest yesterday, had me back at "The Hotel" Christmas party, drinking pink Champagne. When I heard about the rash of reformulations to the Royall Lyme Bermuda fragrance line, I didn't even bother to get the new version of Royall Spyce. Reading Amazon reviews that pound it into the ground was enough to warn me. So I managed to grab a vintage bottle. This is VERY nice, if you like cloves, bay leaves, and nutmeg together. It's a really great cool weather fragrance but could possibly be used on a cooler summer day. I'd also take this over the Bay Rhum fragrance, as it has a little more complexity and appeal. Btw, the Bay Rhum reformulation is ghastly--don't even bother. The only real trouble with most Royall Lyme Bermuda fragrances is that they don't last. They're more like soothing lotions or aftershaves. 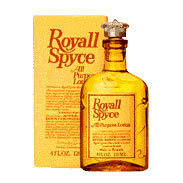 I have frequently used Royall Lyme as an aftershave, alternating with 4711. I wouldn't use Royall Spyce like that, because it's a bit too pungent, not lending itself to another fragrance being layered over. Expect the clove note to linger and linger, but much else here fades fast. Pity. Dry, dry gourmand spices that on "sweet" skin like mine end up smelling like I rubbed pumpkin pie spices all over myself. :) I can see this smelling wonderful on someone who brings out marine or bitter notes in their wearings. Nice, especially for the price, just not for me. Slightly better than the new formulation of Old Spice--slightly better. One of the most refreshing summer, Caribbean, fragrances ever made. Unlike any other lime. There are no member images of Royall Spyce yet. Why not be the first?